Panzergruppe 1 under Paul Ludwig Ewald von Kleist (August 8, 1881-October 15, 1954) advances through through mud in Fall 1941. A Panzer III column passes an leFH18 105mm (4.1 inch) artillery position. Panzergruppe 1 consisted of the 47th Motorized Army Corps (16th Motorized Infantry Division, 16th Panzer Division, 11th Panzer Division) 3rd Motorized Army Corps (25th Motorized Infantry Division, 13th Panzer Division, 14th Panzer Division) and the 14th Motorized Army Corps (SS-Division Leibstandarte SS "Adolf Hitler," SS-Division “Wiking," 9th Panzer Division). Kleist's group had 800 tanks, about 90% of its authorized strength, when Operation Barbarossa began. 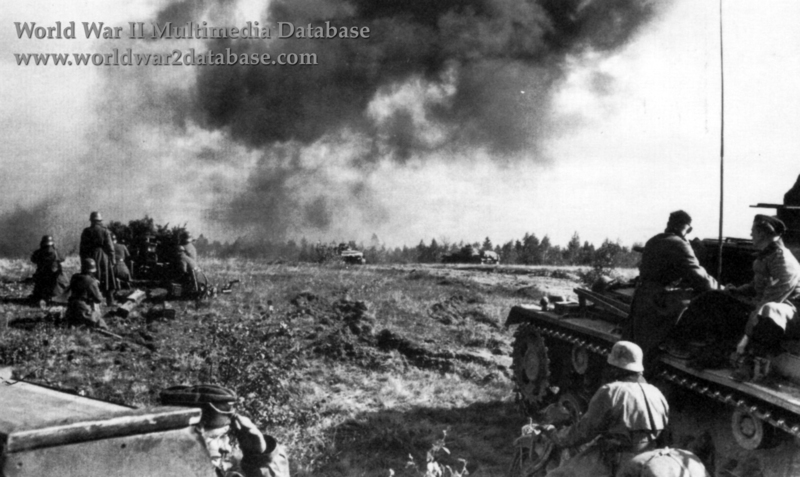 Attached to Army Group South, Panzergruppe 1 was the armored spearhead of the assault through Ukraine, surrounding and destroying the Red Army's 4th, 8th, 9th, 15th and 19th Mechanized Corps at Brody during June 26-30, 1941. this was the largest tank battle until Kursk in July 1943, with some 1,600 tanks involved. After capturing Kiev on September 19, 1941, Panzergruppe 1 became the First Panzer Army on October 6 with the incorporation of the Hungarian Mobile Corps and the 3rd, 9th, and 52nd Italian motorized divisions.